Fiber Flux: Free Crochet Pattern...Cloudy Sky Mobius Cowl! 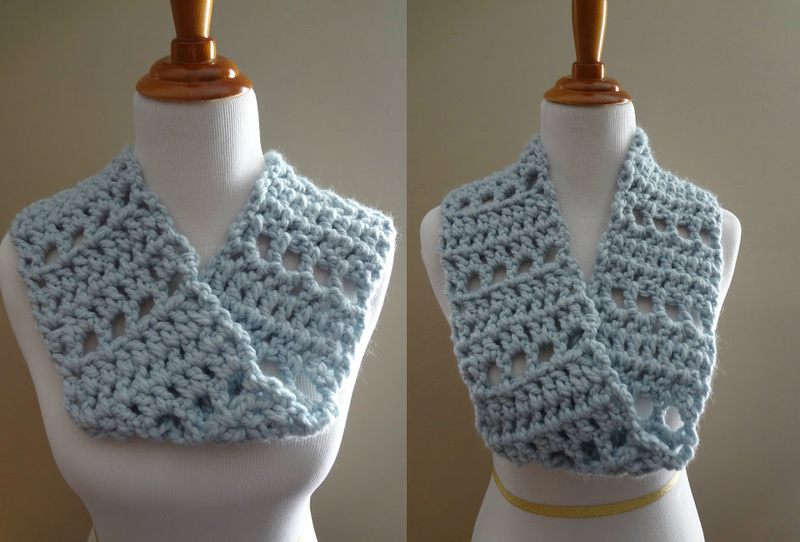 Free Crochet Pattern...Cloudy Sky Mobius Cowl! 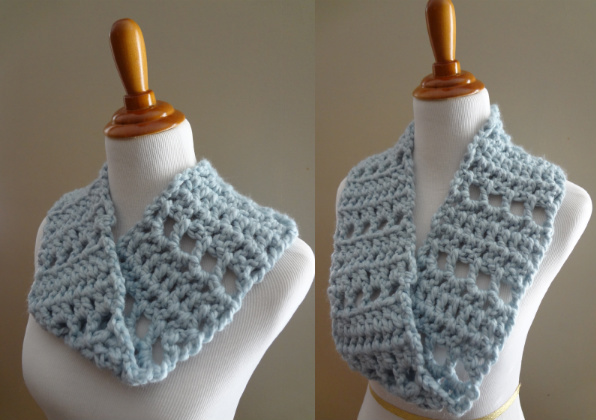 The Cloudy Sky Mobius Cowl is a bulky cowl with a twist...literally! This cowl is chunky, lofty and warm, but also has the added advantage of laying perfectly flat because of the "mobius" or twist made before seaming it together. The stitch sequence was inspired by the Mulberry Shawl. 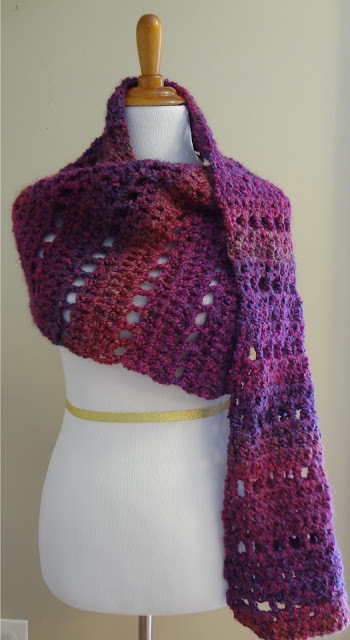 If you like this pattern be sure to check this shawl out too! Note: Both versions each used less than one skein of the yarn, I had about roughly 1/3 of the skein left after the short and 1/4 left after the long. If you desire a longer cowl, keep going until all of the yarn is used up or you could always use a second skein if you like for an even longer piece, like an infinity scarf for example. Note: Stitches in this pattern are worked in the spaces (vs. the stitches). To learn more about working into the spaces, click here. Row 1: Ch 3 and turn, dc in first space and each space to end of row ( including the turning chain space). Row 4: Ch 3 and turn, dc in first space and each space to end of row (including the turning chain space). Repeat rows 2-5 until cowl is desired length (see sizing above for the size and look you like best), weave in any ends. After weaving in ends, twist the piece once and seam the ends using a whip stitch. Very pretty pattern, thank you for sharing it! I love that super thick yarn, it makes for such yummy cowls! Thanks and me too! Love bulky toasty yarn! Love this light color blue!!! truly delightful. So purdy! Thank you for sharing all of these lovely patterns. Yay for crochet! You are so welcome! I am delighted to share with you!! For row 3, are you doing two dc's in the same chain space? I just made one of these last night with 2 balls of gorgeous chunky yarn. Thank you for such a wonderful pattern, I have made up 2 cowls with my yarn and pulled them apart as I was not happy but having found and whipped this one up I am not going to be un-ravelling again. It's warm and it looks good and it only took me an hour or so to do. I will have to get some pictures now. I am having trouble with Row 3..not enough stitches it seems like with no chains in between. Does this make sense? Hope so. thanks and I LOVE your pattern. I too would appreciate a stitch count in multiples plus the final chain addition. If I crochet in the first space of each row I increase by one stitch in each row. Not like with the pattern for your meringue cowl. That worked up perfectly in my own stitch count to make a wider piece. in row 3 and 4, how many dcs do you exacly have including the chain3s??? I would appreciate a count of these rows, thank you for a reply and thanks for your great patterns. Do you think this would work with lion brands homespun yarn? By the way, this patterns is beautiful!! !